Terah Glose, a senior here at Penn State University has been continuously involved with with THON since her sophomore year. Glose's devotion and hard work have finally allowed her to become a dancer this year in THON 2015. Kris Canner, a senior broadcast journalism major, is very active in THON. In addition to being involved through the Singing Lions, Kris is a communications captain, specializing as a general and special interest liaison. Working as the family relations chair for the Singing Lions, Kris keeps in constant communication with his THON family, the Barnett's. Kris's love for THON grew once he joined the Singing Lions and was paired with the Barnett's. He believes their story has given him a powerful and more personal reason to want to dance for the cure. Kris developed a special relationship with the family, despite never meeting Lexi, who passed away in 2011. His favorite moments on the floor were playing with Lexi's two younger brothers, Ethan and Brayden. Penn State senior Jacqueline McNenney is a Special Events committee member spending a total of 38 hours at THON 2015. McNenney is grateful for a committee that is just as motivated as she, especially while working multiple concession shifts. 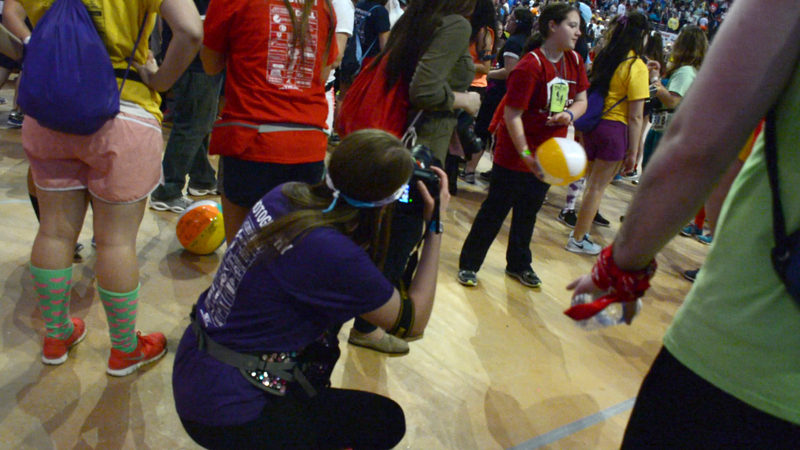 Caity Kramer is a THON PR photographer with a passion for photography. She is a visual journalism major in the College of Communications. 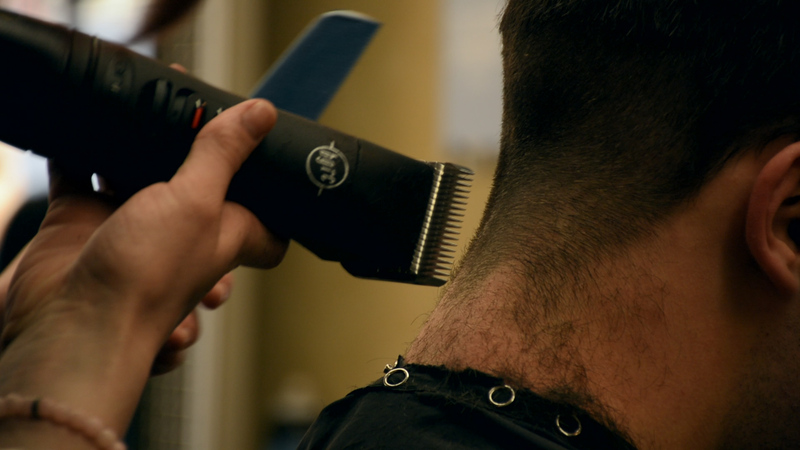 This THON season, Supercuts held its annual “Cut-A-Thon,” donating $1 from every haircut to Penn State’s dance marathon. The fundraiser began on Monday, Feb. 16th and lasted until Saturday, Feb. 21st. In the last week, shift supervisor Ashley Greenaway reports that they’ve serviced over 500 customers. The fundraiser will close on Saturday, and the Supercuts headquarters will be writing the check for THON Sunday morning. Penn State senior Maddy Sova is dancing in THON 2015, representing her sorority Omega Phi Alpha. She loves the support of her Dancer Relations Committee Member, but while he is on his off-shift, Sova has been wondering the floor in search of some entertainment. Surprisingly enough, the free bananas at the Snack Shack have done just that. Surrounded by people in blue shirts with their hands full of trash bags, OPPerations 'OPP' Captain Olivia Rothseid explains some of the work the OPP committees do on THON weekend, like keeping the floors clean and dry, or disposing of trash. Even though he may be a new Penn State alum and the weather tried to keep him away, Eric Van Emburgh made a point to make it to THON for his fifth year in a row. It was a short stay but he made every moment in the Bryce Jordan Center count, standing alongside his Delta Upsilon fraternity brothers. Marli Markovitz is a freshmen this year. She is involved in Rules and Regulations and Ohana at Penn State. Even though she was considering transfering from Penn State one thing kept her from leaving. This is Leanne's first time being involved with THON in more ways than one. She joined a Rules & Regulations committee and is absolutely loving it. Leanne is also a founding sister of the new sorority on campus Phi Sigma Sigma. Since the sorority is new to campus they are not paired with another frat yet, and do not have a THON family. However they didn't let that interfere with their canning efforts. The sorority and Leanne are looking forward to potentially gaining a family and more dancers next year, as well as being increasingly involved. THON is not something that can be put together in one week. It takes months of planning, support, and advertising to make the weekend the biggest and the best event it can be. Hundreds of students help with different committees in the Public Relations department to spread the word about THON. Public relations captain Hunter Fraker explains what they do and how his department and the rest of the THON committees come together to make THON what it is. Will Baldwin is Monitor Engineer for BSI Productions, the company designing the sound for THON 2015. Baldwin helps keep wireless microphones running, and bands playing all through THON weekend. While dancers embarking on the task of not sitting or sleeping for 46 hours are surrounded by strong support systems, those in stands of the Bryce Jordan Center have to get creative when trying to stay entertained and engaged. Kerry Fitzpatrick, a senior in Zeta Tau Alpha, implores an array of activities in order to stay awake, energetic and enthusiastic. Alex Vogul is part of the THON OPPerations committee. She helps maintain the cleanliness at the Bryce Jordan Center for the 46 hours of THON. Vogul volunteers because a family member of hers lost their battle to cancer. Tabitha Pranke, a senior and marketing major at Penn State, finally has the opportunity to experience THON for the first time in here career at Penn State. After transferring from Penn State Harrisburg as a junior, Pranke never had the opportunity to witness the largest student run philanthropy ever. This weekend has been an emotional and exciting one for her. Amanda Bobby's son AJ is enjoying his first THON in five years cancer free. Throughout his illness the family told us the brothers of Theta Chi have helped boost their morale, taking AJ mattress surfing in their frat and letting him mercilessly squirt them with his water guns during his favorite day of the year- THON. Bobby explained to us how THON has been instrumental in keeping the family's spirits high and to the development of their three children the past few years. Being a dancer at THON is a rewarding experience, but can be extremely tiring at times. Luis Ahumada, a member of the Special Events Committee, works at the Dancer Mail Station, which allows people to write to dancers who are down on the floor. The encouraging words from family and friends help dancers push through when their energy is running low. Michael Palm seems like your average high senior. He recently accepted his offer to attend Penn State University this summer which was a dream he has had since he experienced his first THON 12 years ago. The Palm family heard about the Four Diamonds Fund when Michael was diagnosed with Acute Lymphoblastic Leukemia at age 6. Once a student at Penn State, he is excited to finally give back to the kids who have to go through everything he once did. Despite not being part of any THON group or committee, freshman Ryan Moran is dedicating his nights this weekend to one purpose: cheering up people at THON. Armed with a neon green "Free Hugs" sign, Moran does laps around the outer ring of the Bryce Jordan Center for 13 hours straight each night. He says he wanted to do something fun that would help cheer people up, and that during the long stretches of the marathon's late nights he figured there would be a lot of weary people. After graduation, Zoe is moving to Thailand to fulfill her dream of working for Documentary Arts Asia, a documentary photography non-profit that focuses on capturing Asian social issues. Hoping to make my career after graduation in sports production. My goal is to produce feature films on athletes to allow fans to connect and learn more about their favorite players. Seeking a position in the field of broadcasting journalism where I can utilize my skills, abilities and experiences to ensure the company’s success. I am an ambitious and self-motivated individual who offers a variety of skills that would make me a valuable addition to your company. After graduation, I would like to be a producer for an Entertainment TV Show. I’m interested in doing on-camera anchoring and reporting. I also have an interest in documentary work. I want to pursue a career as an on-camera reporter in the sports or entertainment field. My ultimate career goal includes work as a producer and on-air talent in sports and entertainment. My goal after graduation is be working as a reporter for a television station. My name is Gabrielle Yocum and I am a senior at the Pennsylvania State University studying Broadcast Journalism and minoring in Sociology. I am looking forward to working at Zoomph in Reston, Virginia after graduation as a Marketing Specialist. Shannon Ryan is a mutimedia journalist and passionate storyteller who plans to pursue a career in television news. She is graduating in December, a semester early. As a student reporter she traveled to Greece to cover the refugee crisis and to Brazil to cover the 2016 Paralympic Games. Shannon has interned for the New York State Broadcasters Association, NBC WNYT-NewsChannel 13 in Albany, N.Y., ESPNU as a campus correspondent, and as a sideline reporter for the Big Ten Network StudentU’s; which stream live on BTN2go.com and air on the Big Ten Network. She also works for Penn State Athletics, in production and as a reporter. She has also freelanced for CBS This Morning. This summer she will be the daytime news intern for FOX29 Philadelphia.